Take a tour of the basketball-court-sized kitchen in Uman's Scheiner Hachnosas Orchim. The Scheiner Hachnosas Orchim center is Uman's biggest dining hall. 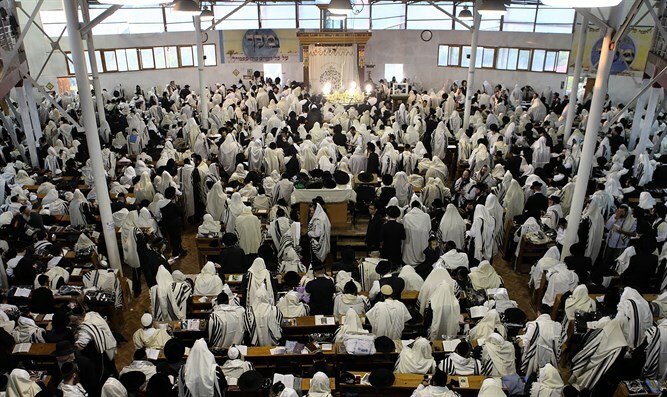 The size of a basketball court, its kitchen serves food for the estimated 30,000 worshippers making the annual pilgrimage at the tomb of the founder of the Breslov movement, Rabbi Nachman. Built in 2013, the kitchen’s 37 ovens and 17 burners will be used to cook 18 tons of meat, 13 tons of chicken and 105,000 pieces of fish, along with 250,000 challah rolls. The food alone costs over $400,000. The massive dining hall is a tent city stretching over 15 dunams. It can seat 15,000 people, and meals are eaten in two shifts. Preparing food this year will be particularly challenging, as the holiday stretches for three days as opposed to the usual two.